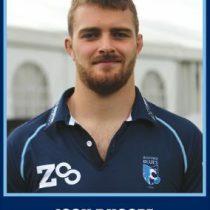 Josh Buggea will spend his second season at Bedford Blues durong the 2016/17 campaign. His previous club, Worcester Warriors had him on loan to the Doncaster Knights to gain experience. The former England u18 representative was educated at the same institution as '74 British and Irish Lions player Geoff Evans as well as England 1st receiver Shane Geraghty, namely Bablake School. He has the AASE trophy under his belt which was won in 2011 while he was playing for Hartpury, the victory came against Oaklands College.